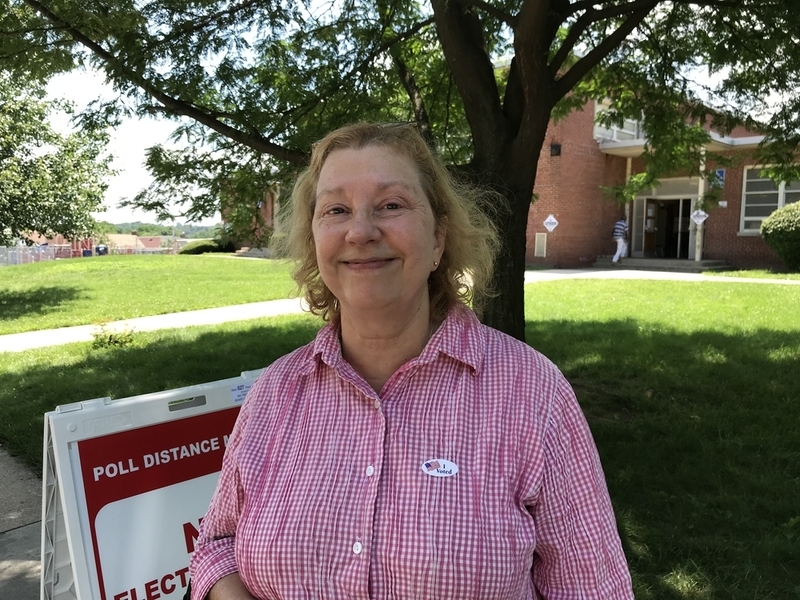 In Brooklyn Park, Republican voter Dorothy Lopez came out to cast a ballot for @GovLarryHogan , even though he’s unopposed. “I’d like to see Hogan stay in, that’s the main reason I came out,” said Lopez, 50. 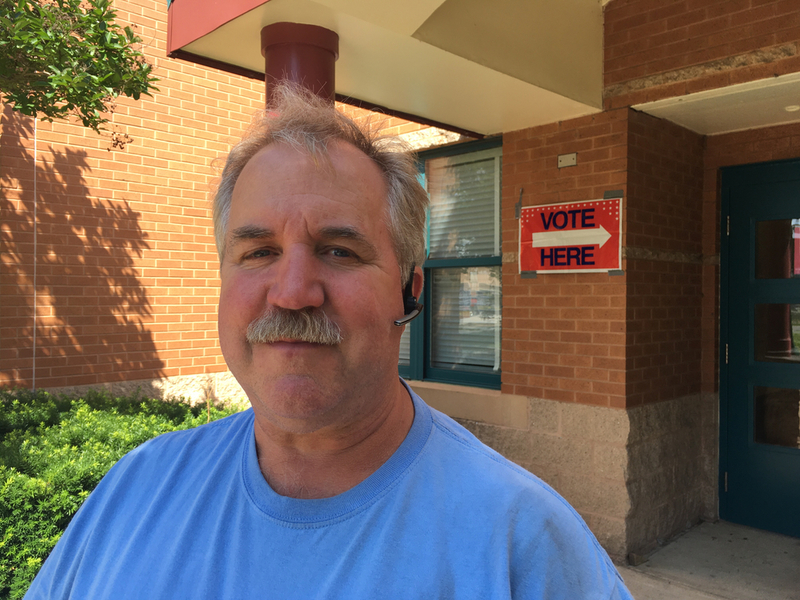 Michael McFerren, voted at Prospect Mill Elementary in Bel Air. Michael McFerren, of Bel Air, said he is interested in the race for county executive “because they control, or attempt to control, the purse strings. The Republican, who has a decal on the back of his car that says “My big gun family,” was also interested in the state’s attorney’s race, where four people are seeking to succeed Joseph Cassilly, who is retiring after 36 years as state’s attorney. McFerren declined to say who he voted for for state’s attorney. Democrat Jon Cupp, of Bel Air, said it didn’t matter that most of the Harford races are in the Republican primary. While he’s a regular voter, the race for governor drew him to Tuesday’s primary. He had planned to vote for Kevin Kamenetz, but after his death Cupp had to do his homework to find the right candidate. “I’m not crazy about anybody,” said Cupp, who voted for Ralph Jaffe. In the General Election, however, Cupp said he’ll vote for Republican incumbent Gov. Larry Hogan, who’s surprised Cupp. 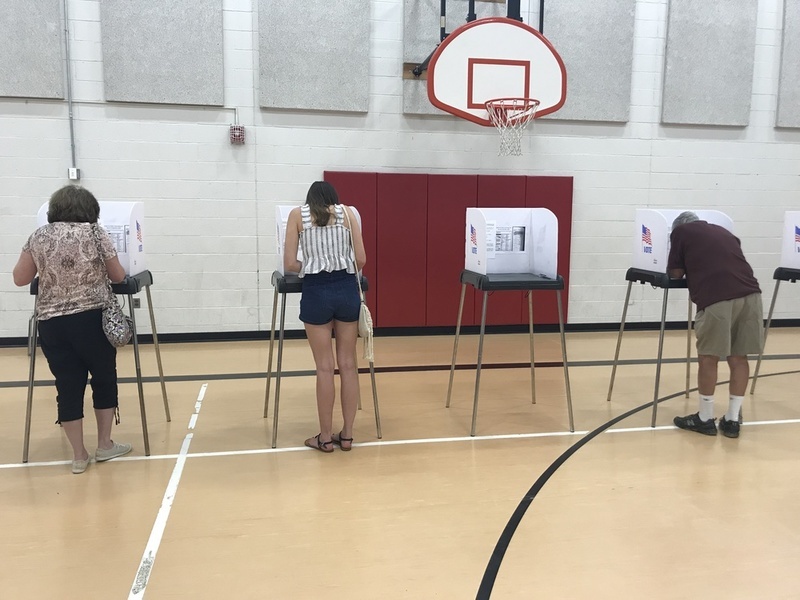 Voters cast their ballots at Prospect Mill Elementary School in Bel Air on Tuesday morning, including a 17-year-old who was voting for the first time. James Baker, 58, voted at Middle River Volunteer Fire & Rescue. The county executive race is most important to the Wilson Point voter, who pinpointed high taxes as an issue that particularly bothers him. Russell Royahn tried to switch his registration from Democrat to Republican about three months ago. Today, he’s one of the up to 80,000 casting their vote using a provisional ballot. Royahn, 77, voted at White Marsh Library. He was handed a voter update form, and said he doesn’t have any concerns about the fact the change wasn’t made. “It’s just the way the system works,” he said, chuckling. He said the county executive race is most important to him, and he’ll be supporting Al Redmer, who he said he’s known for a long time. Karen Phillips, 55, said she’s supporting candidates who Maryland Gov. Larry Hogan supports in the primaries. 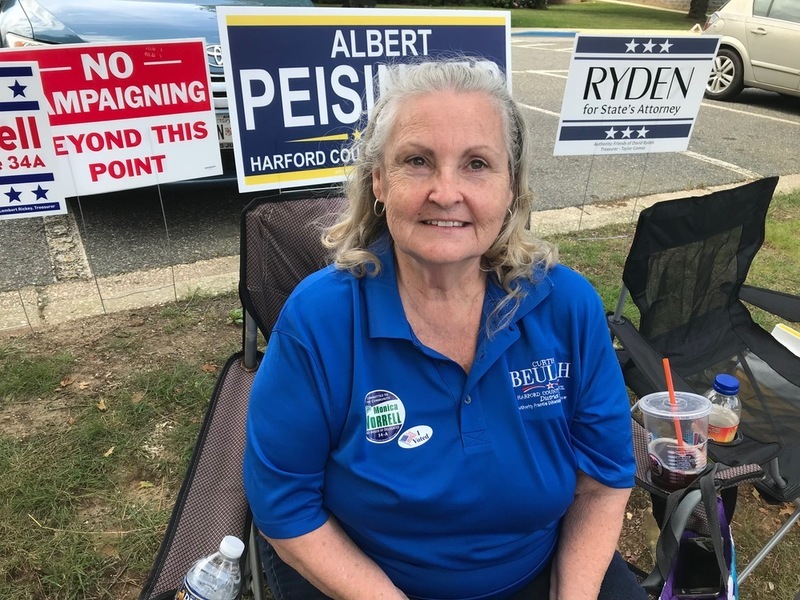 Phillips, a Rosedale resident, voted at White Marsh Library and said she voted for Al Redmer for the county executive race — the most important one to her — because he’s a businessman. Becky Lovelace, who is retired but substitute teaches in Baltimore County Public Schools, said gun control issues are what brought her to the polls today. “After Parkland, when I went to school the next day and I saw those kids’ faces, all I could think about was, 'What if it had been one of them? '” she said. Lovelace, 64, said she’s been voting in the county since she was 18 and never had any issues voting before. There was a temporary jam when processing her ballot, but it was resolved. She is a Democrat, but her party affiliation may change before the general election, she said. “There are a couple Republicans I think have done a really nice job,” Lovelace said. She added she’ll wait until she sees more debates before deciding who she’ll support in the gubernatorial election in the fall. Doris M. Tavron, 86, of Northeast Baltimore, had voted early but came out Tuesday morning to volunteer. 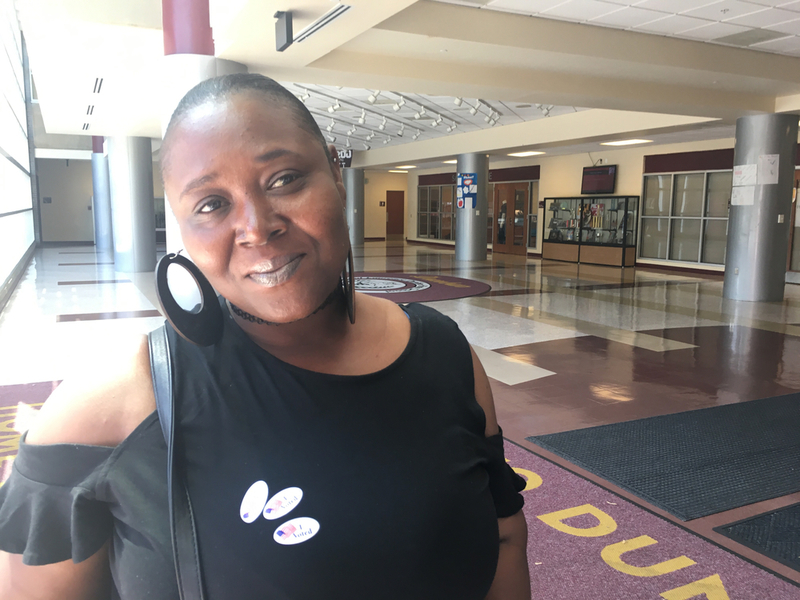 Tavron, who was on her way to work the polls at Rodgers Forge Elementary School in Rodgers Forge, said education and school safety were top issues for her. “I would love to see them put some kind of machine that the kids have to pass through going to classes, so they don’t miss somebody with a gun or some kind of dangerous weapon,” said Tavron, a retired cook. Tavron, a Democrat, did not vote for a candidate for governor because she plans to support Gov. Larry Hogan in the general election. Rodgers Forge resident Susan Barcus, a retired hospital laboratory worker and registered Republican, said she also plans to support Hogan. “I’m voting the Republican agenda,” she said. Down the street at Dumbarton MIddle School, the polls were mainly empty. By about 9:30 a.m., only about 70 people had come in to vote, said Chris Amberger, chief Republican judge for the precinct. Stephanie Fleming, 58, a lifelong Dundalk resident, settled on Ben Jealous for the Democratic nomination for governor. Stephanie Fleming, 58, a lifelong Dundalk resident, said she debated for a long time who to pick in the Democratic primary for governor. She ultimately settled on Ben Jealous. “He knows what hard times are. I think he would do a good job,” Fleming said of Jealous. Fleming said she thinks Jealous would focus on the needs of nearby Baltimore City, which is important to her. Even though she supported Jealous in the primary, Fleming wouldn’t rule out possibly voting for Gov. Larry Hogan in the fall. “It’s not that I’m unhappy with Hogan. I don’t have a problem voting for a Republican. ... I’ll see in November,” she said. 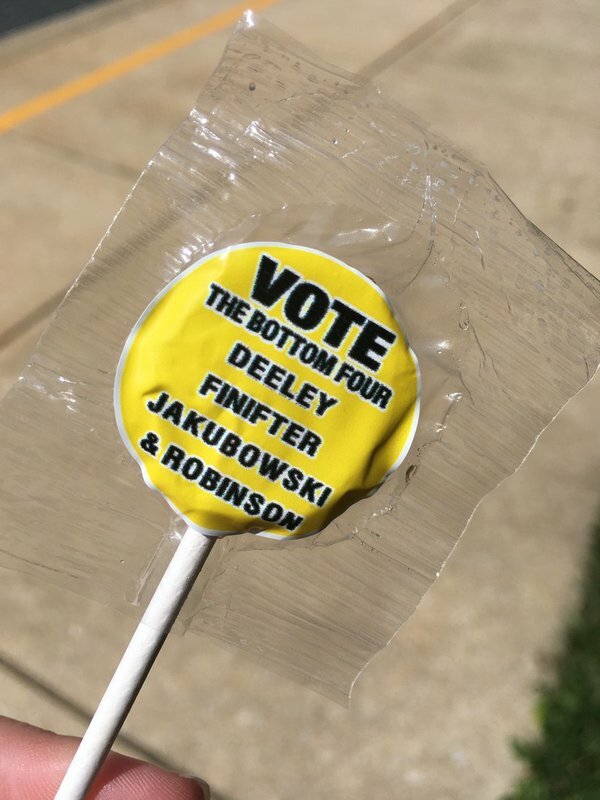 In the Baltimore County executive’s race, Fleming cast a vote for fellow Dundalk resident Johnny Olszewski Jr. She noted the Olszewski family’s history in politics — John Sr. used to be on the County Council — and thought Olszewski would do well for the community as county executive. Louise Ruth, 77, of Dundalk, voted for Democrat Johnny Olszewski Jr. for Baltimore County executive. 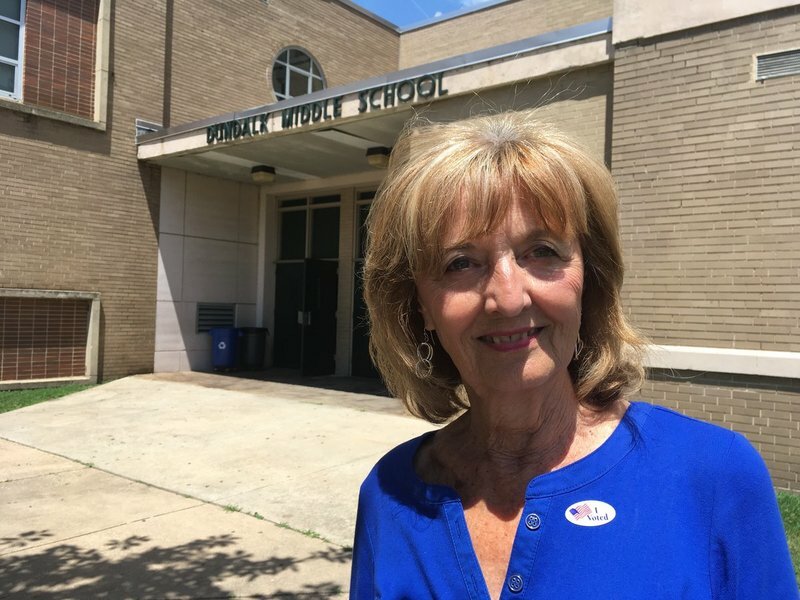 Louise Ruth, 77, voted for Johnny Olszewski Jr. in the Democratic primary for Baltimore County executive when she cast her ballot at Dundalk Middle School. “I just think he’s a good family man, and I think he’s good for our county, our schools and hopefully our police department,” Ruth said. Ruth said she’s seen television ads in the race and received numerous mailers — sometimes multiple mailers per day for the same candidate. Deborah Dailey of Glen Burnie brought her 4-year-old granddaughter, Aleiyah Jacobs, to the polls. Brooklyn Park Middle School has two precincts. As of noon, 174 people voted between the two precincts, including just eight provisional ballots. “It’s been pretty slow,” said chief judge Kimberly Stewart. Deborah Dailey of Glen Burnie brought her four-year-old granddaughter, Aleiyah Jacobs, to the polls at Brooklyn Park Middle School. A Democratic voter, Dailey said she had a difficult time choosing a candidate in the gubernatorial primary. “I did manage to pick,” she said, though she prefers to keep her vote secret. Dailey, who voted at lunchtime, expected to see more fellow voters. “It was very easy. I expected a lot more people. I imagine early voting took care of that,” she said. Dorothy Lopez, 50, is a Republican voter who came out to vote for Gov. Larry Hogan at Brooklyn Park Middle School, even though he’s running unopposed in the GOP primary. “I’d like to see Hogan stay in, that’s the main reason I came out,” said Lopez, who is self-employed and lives in Brooklyn Park. Harford County voter Rob Hruz, of Bel Air, poses outside the polling place at Bel Air Elementary School Tuesday afternoon. Republican voter Rob Hruz, 56, of Bel Air, cast his ballot at Bel Air Elementary School on Tuesday afternoon. He is a self-employed real estate appraiser for the federal Department of Veterans Affairs. He said he supports David Ryden, deputy state’s attorney for Harford County and one of four Republican candidates in the race to be Harford’s next top prosecutor and succeed State’s Attorney Joseph Cassilly. Cassilly plans to step down after more than 30 years in office. “I like what Ryden has done for Joe Cassilly, and I think he needs a fair shake,” Hruz said. He said he also supports Jan Christensen, one of three candidates challenging incumbent Republican Del. Susan McComas in the District 34B legislative race, and Susan Burdette, the Bel Air mayor and one of three Republican candidates running for the District C seat on the Harford County Council. Hruz said it was an easy process to vote at Bel Air Elementary, simply filling out his ballot. There had been 180 ballots cast at the school as of noon Tuesday, with 84 Democratic and 96 Republican ballots, according to the posted vote totals. Shelby Getz, the Democratic chief judge, said his polling place had not been affected so far by the statewide issue that has forced as many as 80,000 voters to use provisional ballots because of an MVA computer glitch. Only one person had requested a provisional ballot so far, and that was because they did not have transportation to their assigned polling place. The voter was allowed to vote at Bel Air Elementary using the provisional ballot, Wagner said. Patricia Skebeck, 75, of Kingsville, is a registered Democrat who voted at Fallston Middle School on Tuesday morning. She is a retired Harford County Public Schools teacher, administrator and director of elementary education who served as interim superintendent of schools. She declined to say who she voted for in the Democratic primary for governor, but she ranked it as one of the races that is most important to her, along with Harford County executive and Board of Education. The school board races will not happen until the general election in November, since the candidates are nonpartisan and some races only have one or two candidates for each seat. “Some of the people [in office], I think they did a good job and for some of the others, I think we need a change,” Skebeck said. Teen volunteers with the campaign of David Ryden, one of four Republican candidates for Harford County state’s attorney, held poles with campaign signs for Ryden, Harford County’s incumbent sheriff Republican Jeffrey Gahler and Aaron Penman, a Republican candidate for state delegate in Legislative District 7, affixed to them. They greeted voters and handed out campaign literature. “It’s a lot slower than it usually is,” Emily Schneider, 17, of Forest Hill, said of the morning turnout at Fallston Middle School. Schneider said she has been working on political campaigns since childhood. The registered Republican said she was able to vote for the first time Tuesday, since she will be 18 by the general election. Her fellow volunteer, Brandon Mikolaichik, 18, of Fallston, also voted in his first election. “If you’re sitting there complaining about something you don’t like, now you have a chance to do something about it and change things for the better,” Mikolaichik, a registered Republican, said. Cynthia Gribbin, 58, of Fallston, brought her 19-month-old grandson, Graham Jordan, with her to the polls at Fallston High School. The registered Republican voted a straight GOP ticket, as required in the partisan primary. “I want to be able to continue to vote, but I don’t think I’m a strict party voter anymore,” she said. “I just feel like a lot a lot of women worked very hard for me to be able to vote, so that’s why I’m here today,” she said, citing figures such as Susan B. Anthony who fought for women to gain the right to vote in the U.S.
Joshua Barlow, one of 13 candidates to be a Republican Party nominee in the District 7 House of Delegates race, stood near the high school among other candidates or their supporters who tried to talk with voters and hand them campaign literature. Barlow, a resident of Monkton, touted the fact that he has not taken any contributions from lobbying groups, individuals only. He said he thinks he has been “pretty competitive” despite having less money than his opponents. “It’s sad to see money taking precedence over principle,” he said. Barlow noted the low turnout Tuesday morning. “I’m hoping the afternoon brings out more people getting off work,” he said. 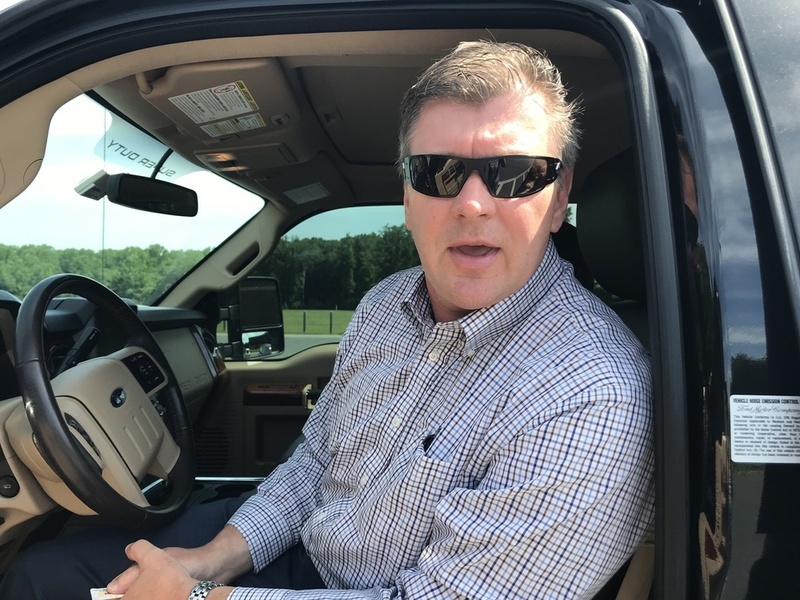 Barlow wore a bright red "Make America Great Again" cap and confirmed he is a supporter of Republican President Donald Trump and Maryland's incumbent Republican Gov. Larry Hogan. "How can you argue with peace and prosperity?" he asked. Republicans Mary Ann and Jeff Brister, of Woodbine, said they "just always vote." Mary Ann and Jeff Brister have lived in Woodbine for 22 years, and the Republicans said they "just always vote." This election, Mary Ann said the choices were fairly easy since many Republican candidates were unopposed. She supports both Howard County Executive Allan Kittleman and Gov. Larry Hogan for second terms. Since last month's deadly flood in Ellicott City, one of the major issues for local candidates, including Kittleman and his likely opponent Democrat Calvin Ball, has been how to rebuild the town and stop future damage. 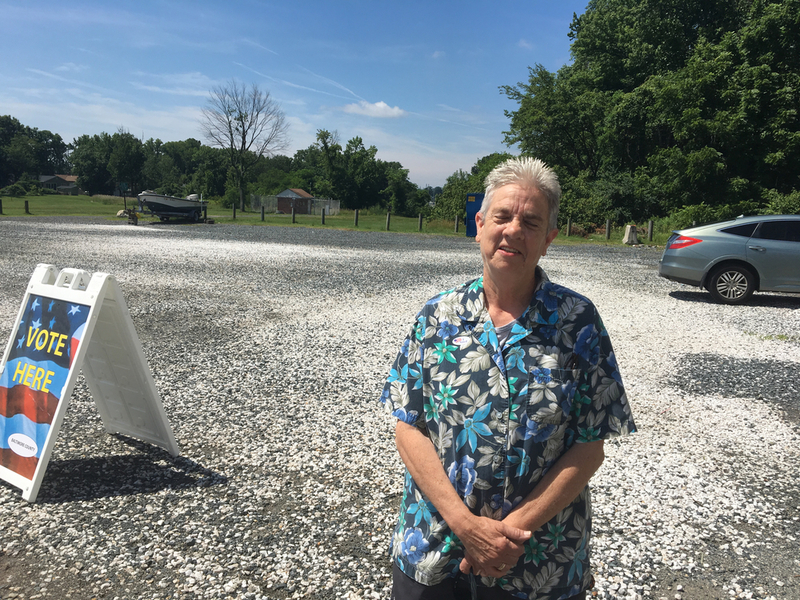 While Mary Ann said she wants to find a solution for the town, she's not sure continuing to rebuild in the same way is the answer, especially since the funds for that construction could come from her tax dollars, which she said are already too high. "Just to keep throwing money at it if it could be destroyed again makes no sense," she said. Olanrewaju Absoede Adeyemo called voting the U.S. "beautiful." Olanrewaju Absoede Adeyemo came to the U.S. from Nigeria in 1988 and became a citizen, and registered Democrat, in 1994. She hasn't missed an election since. Voting in the U.S., she said, is "beautiful," especially compared to elections in Nigeria, which she called corrupt. The 63-year-old mother and grandmother said she voted today in hopes of bringing in new leadership. She's been "disturbed" by the recent political landscape at the national level and temperament of the president. Some days she doesn't turn on the news because she doesn't like listening to him. "I want change," she said. "What's going on now is not good. I've never experienced anything like it." Despite her recent frustration with politics, Adeyemo said that getting to cast her ballot is "life changing," and she'll be back in November. Ellicott City resident Ayesha Gulistan and her 7-year-old daughter Zayna Fasihuddin were at the polls together. The 37-year-old said she brought her daughter to show her the importance of getting involved. "In order to make change happen you have to have a voice [and] be a part of the solution," she said. "It starts with voting for the right representatives." Gulistan, a physician at Howard County General Hospital, said she was most concerned about the Howard County Board of Education election. She's supporting Saif Rehman because she believes in his tech and finance skills, something she said is important to help allocate more money to the school system and keep class sizes small. 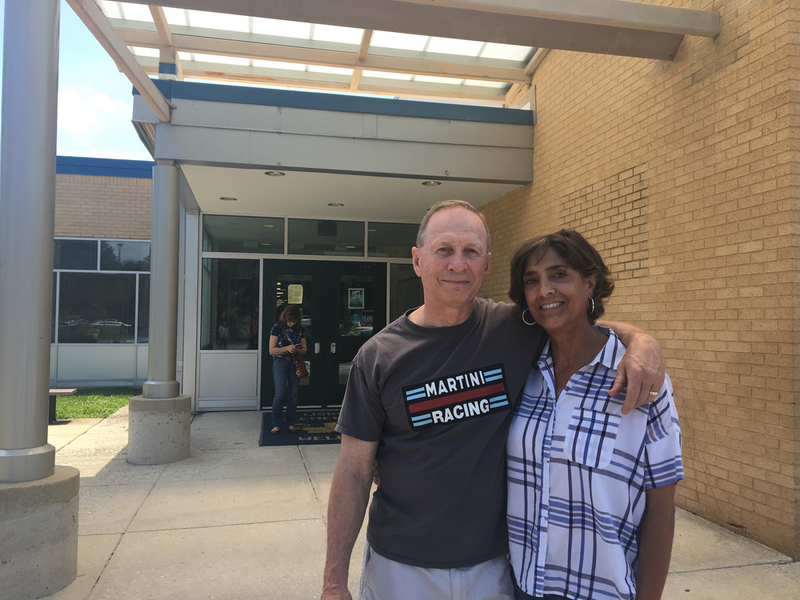 A Pakistani immigrant, Gulistan was excited to cast her ballot in the gubernatorial primary for Krish Vignarajah, who she plans to support in November. In a year that will bring large change to the Howard County Council, Ellicott City resident Ron Levendusky, 64, said he felt fortunate to live in the county's sole district with an incumbent candidate, Democrat Jon Weinstein, who he said he supported. At the state level, Levendusky said he was ready to vote for the late Kevin Kamenetz, but since the candidate's death in May, he voted for Ben Jealous, though he hasn't decided yet if he'll stick with Jealous if he makes it to the general election or if he'll support incumbent Republican Gov. Larry Hogan. In West Baltimore’s Bridgeview/Greenlawn neighborhood, signs on the main doors of Friendship Preparatory Academy at Calverton redirected voters to a new polling place around the corner at James Mosher Elementary School. Voters in West Baltimore’s Bridgeview/Greenlawn neighborhood who showed up ready to cast their ballots at Friendship Preparatory Academy at Calverton were redirected to a school around the corner, despite sample ballots sent to them in May that listed Friendship as their polling place. Signs on the school’s main doors at 1100 Whitmore Ave. notified voters that the polling place had been moved to nearby James Mosher Elementary School. But at about 11 a.m. there were no signs on the side doors, where voters have entered on past Election Days. 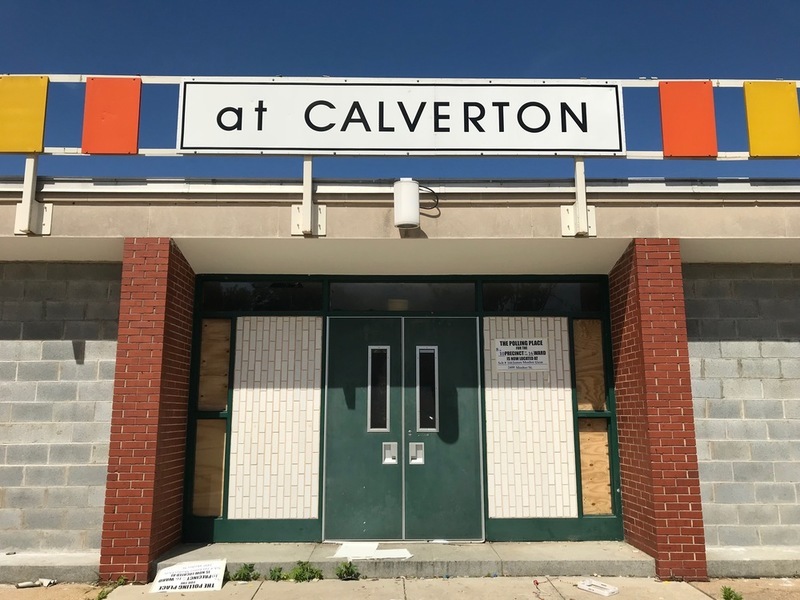 Friendship Academy — previously Calverton Elementary/Middle School — has been closed since early January, when cold weather caused plumbing and heating problems. Students were relocated to another building in February to finish the school year. “There’s obviously some type of disconnect between the Baltimore City Public Schools system as well as our Board of Elections, and the community wasn’t notified,” said Del. Antonio Hayes, who is running for state senate. Hayes held a small news conference outside Friendship Preparatory Academy on Tuesday morning to encourage local residents to vote at James Mosher Elementary School instead. Several voters at James Mosher, which housed voting for two precincts, said they were not notified of the change until Tuesday. They said the lack of communication about the move was especially troubling given the high number of senior citizens who live in the neighborhood. Linwood Woody, a 65-year-old Democrat, said he didn’t find out about the polling place relocation until he came to Friendship Preparatory Academy ready to vote. People outside the building told him to go to the elementary school around the corner, he said. By about 11:30 a.m., 85 voters had cast ballots between the two precincts at James Mosher. Hayes said the polling place in past elections has drawn 300 to 400 voters. Armstead Jones, election director for the Baltimore City Board of Elections, could not immediately be reached for comment Tuesday afternoon. 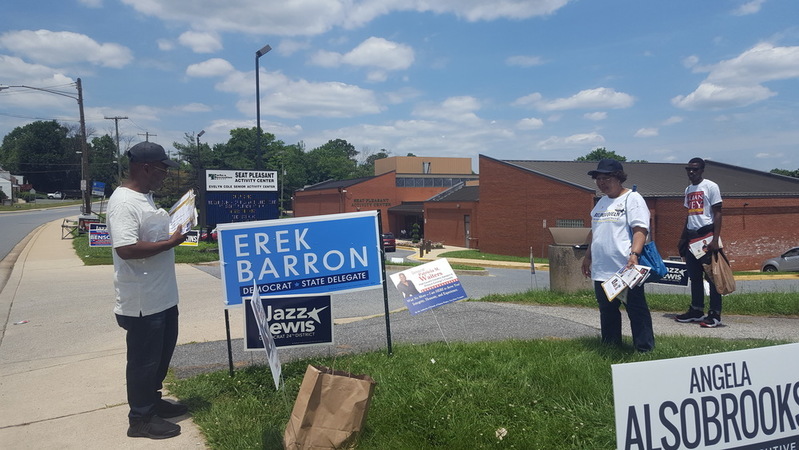 Mable Robinson, whose daughter is running for Prince George's County school board, campaigned outside the Seat Pleasant Activity Center. 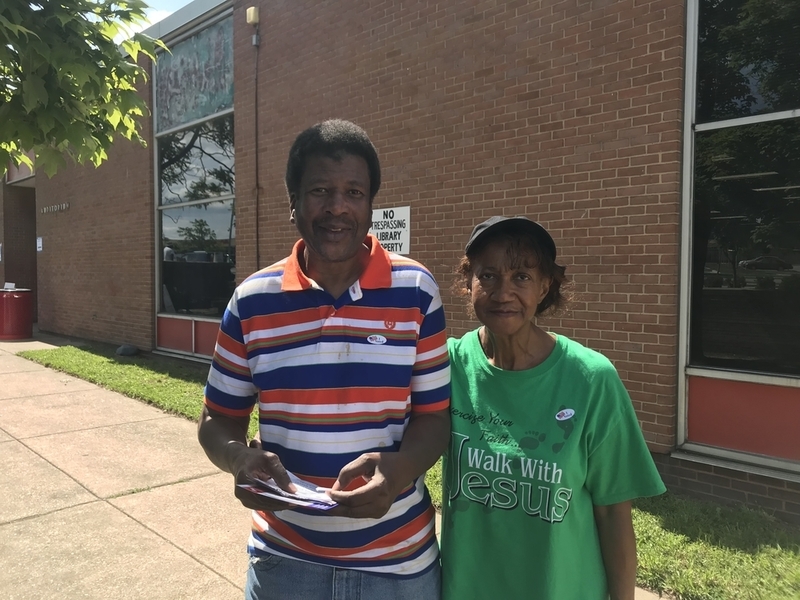 Leaving the polling place in Prince George's County near the D.C. line, retired transportation manager Sam Shands said he was paying most attention to the races for governor and county executive. At the top of the ticket, Shands, 70, said he voted for Ben Jealous, citing his leadership of the NAACP. 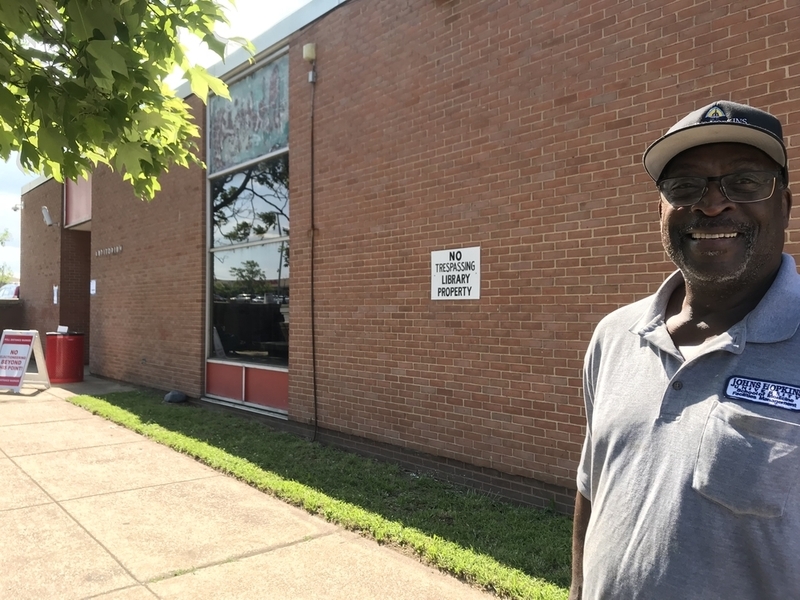 Shands, who voted at the Seat Pleasant Activity Center, said he didn't like current county executive Rushern Baker because he proposed increasing taxes to fund schools. "To be truthful, I didn't care for that other guy," Shands said. "It was an extreme number he wanted to raise taxes." About a mile away at Cedar Heights Community Center, teachers aide Marshae Luckett, 44, said she was backing Baker. "He's our current county executive and I think he will do great things as our governor," Luckett said. She said Baker's record on education was mixed but that he'd be able turn things around if he won higher office. Judges at both polling places said things were going smoothly by early afternoon. Just two people at each location had cast provisional ballots. Barbara Chase-Dyer, 72, a semi-retired home health worker, wouldn't say who she supported but said she views the election as being mostly about holding President Donald Trump accountable. "Our president is a wild man," the Democratic voter said. "I don't know why he hasn't been impeached." Judy Aleksalza woke before sunrise in Ocean City, slid in her Mazda Miata, and passing more deer than drivers traveled two hours back to Baltimore to vote. Since casting her first ballot half a century ago for U.S. Senate candidate Joseph Tydings — before the voting age changed from 21 to 18 — the retired tape editor at WJZ-TV has never missed an election. 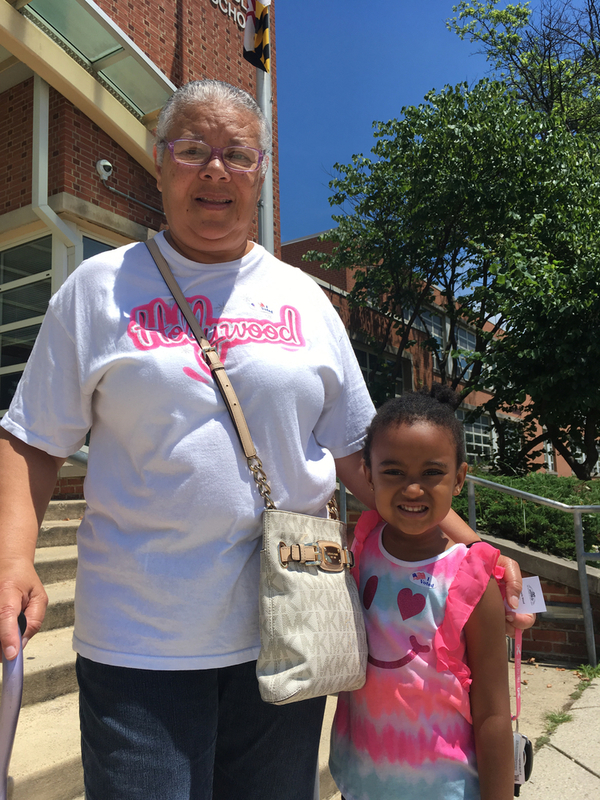 And though the 75-year-old Democrat would rather be on the beach Tuesday, she was walking into George Washington Elementary in Pigtown to vote for Richard Madaleno for governor, Ben Cardin for U.S. Senate and Ivan Bates for Baltimore state’s attorney. Afterward, she hurried back to her car. It was 150 miles back to the beach. Republicans Mary Ann and Jeff Brister said they "just always vote." Mary Ann and Jeff Brister have lived in Woodbine for 22 years and the Republicans said they "just always vote." Olanrewaju Absoede Adeyemo called voting in the U.S. "beautiful." 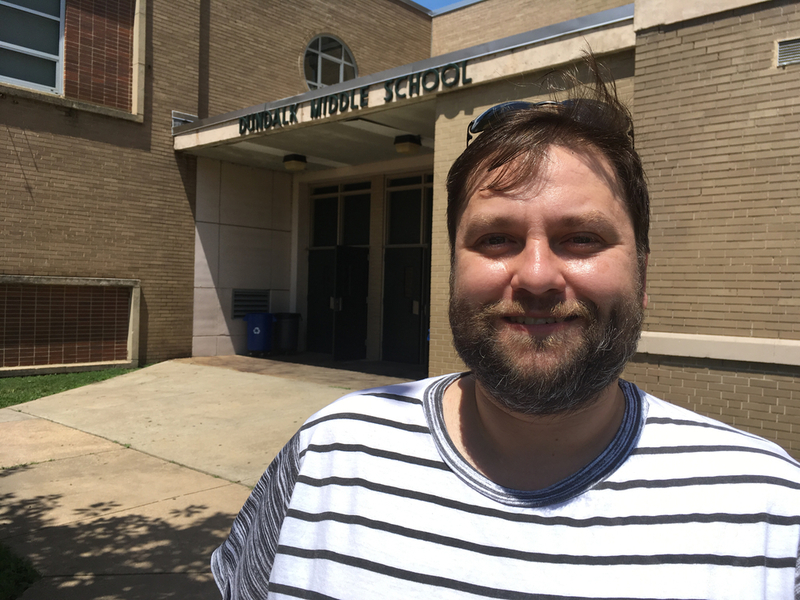 Democrat Jason Leaseburg, 36, of Hollins Market, said in front of his polling place at James McHenry Elementary School that he wanted to vote for progressive candidates who will stand up to the federal government and "the harm" that he said it's doing. The governor's race is the most important for Leaseburg, who supported Ben Jealous because he thinks Jealous has the best chance to defeat Republican Gov. Larry Hogan in November. Edward Carey, 34, said his decision for Baltimore County executive was going to "go down to the wire." 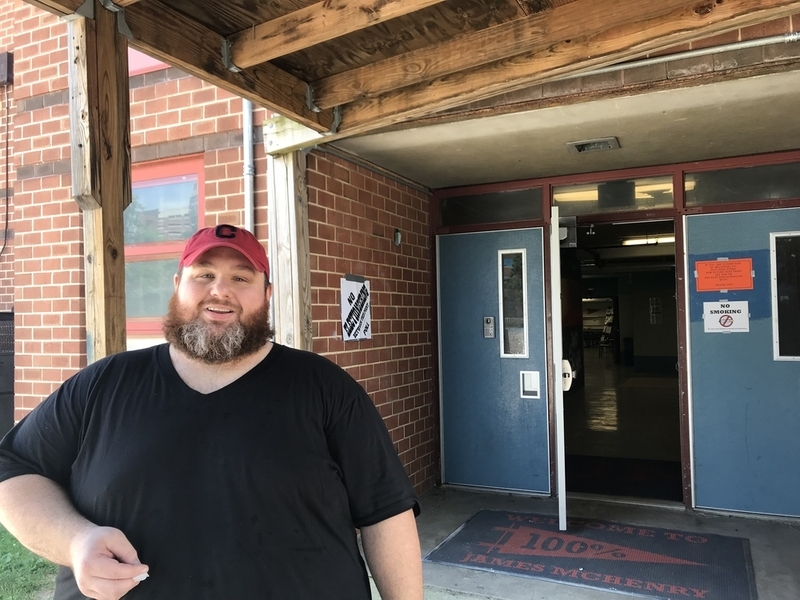 Edward Carey, 34, went to vote at Dundalk Middle School, but poll workers told him he was supposed to vote at Dundalk Elementary, so he headed there. Carey said he always makes sure to vote and didn’t mind having to go to another location. Carey said he planned to vote for Ben Jealous in the Democratic primary for governor. He likes that Jealous headed the NAACP and worked the campaign trail for Bernie Sanders two years ago. “I just think he’s a smart guy. I like his views — very progressive,” Carey said of Jealous. 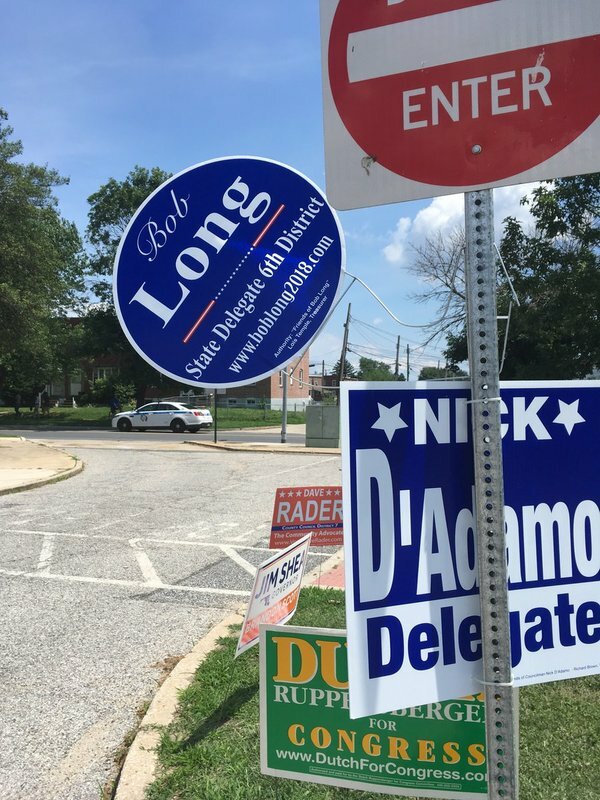 Picking a candidate for Baltimore County executive is tougher, he said, and his decision was going to “go down to the wire." He was leaning toward Johnny Olszewski Jr., partly because Olszewski is from Dundalk. Chakka McKnight, left and Roberta Pickney outside of their polling place at the Herring Run Branch Library in Orchard Ridge. Roberta Pinckney, 72, voted at the Herring Run Branch Library in Orchard Ridge with her brother, Chakka McKnight, 56, and said reducing crime was what brought her to the polling booth. Pinckney said she was particularly focused on the state's attorney and state senate races, but wanted to keep who she voted for to herself. She said she hoped the candidates she voted for will "make an effort to make things better and make this city a better place." She is frustrated by Baltimore's reputation as a city with a lot of crime. 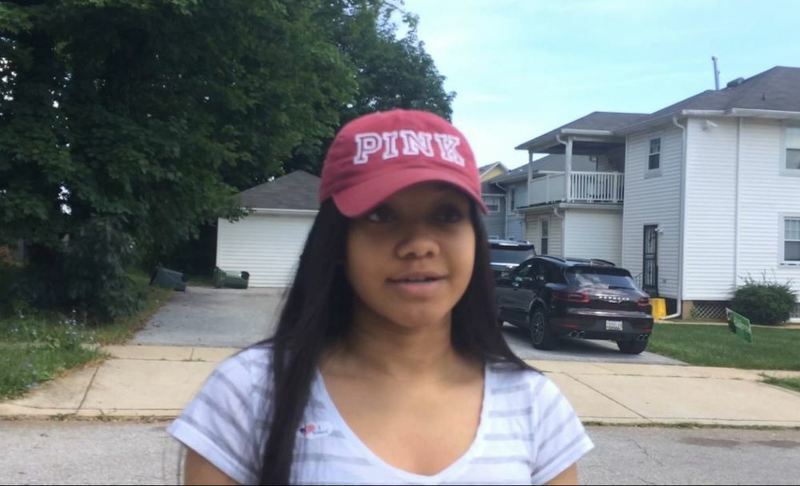 Pinckney moved to Orchard Ridge more than 15 years ago to take care of her mother and said it has gotten more dangerous since then. She said young people are moving to the community and "bringing crime with them." "It's gotten worse," she said. "Not only in this area but all over. It shouldn't be this way." Also at Herring Run Branch Library, Mark McCoy, 48, of Baltimore said an issue "near and dear to my heart" is urban renewal and the creation of affordable housing. He said he hoped the candidates he voted for would repurpose vacant homes. "We have too many abandoned houses that need to be fixed up and rented out to lower-income families," he said. He said the state's attorney race was important to him but declined to say who he voted for. Crime was a key issue in the primary election for Catina Cozart, 45, of East Baltimore. She came to Paul Laurence Dunbar High School to cast her vote to re-elect Marilyn Mosby as Baltimore's state’s attorney. Cozart declined to say who had her vote for the Democratic nomination for governor. But she said she voted to re-elect U.S. Rep. Elijah E. Cummings. The voting process at Dunbar went smoothly, Cozart said. Things were more complicated for Anthony D. Banks-Bey. The 66-year-old said he’d been voting at Dunbar all his life, only to be told Tuesday that he needed to go to another polling location. An election judge, upon hearing him, came over to assure Banks-Bey that he could vote at any location, if he was willing to vote by provisional ballot. “We can’t not let you vote, by law,” she told him, ushering him back into the cafeteria. Mark Clemens, 52, of Edgemere is a registered Democrat, but supports Republican Pat McDonough for Baltimore County executive. Mark Clemens, 52, of Edgemere supports Republican Del. Pat McDonough for Baltimore County executive. 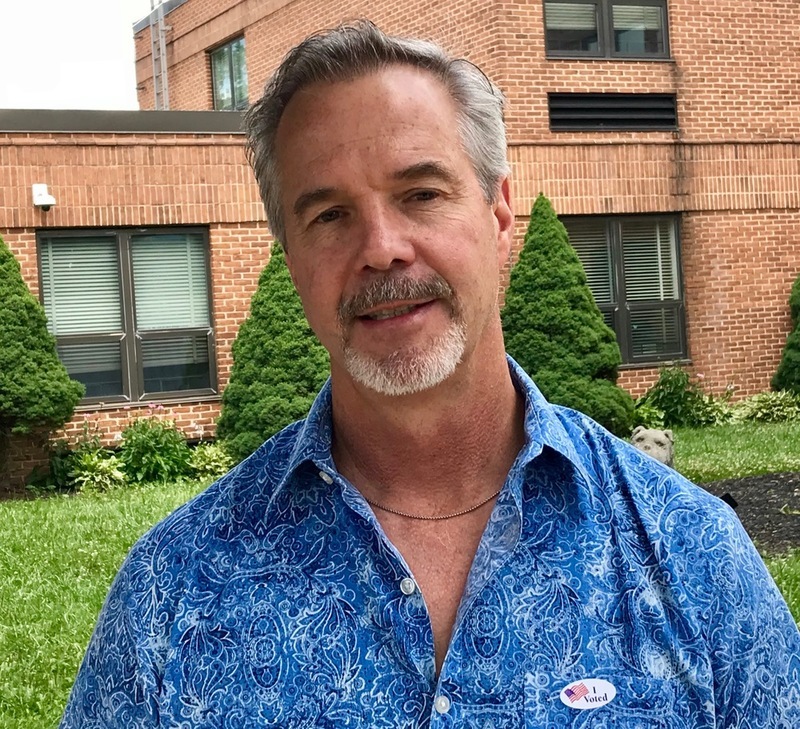 But he’s a registered Democrat, so he had to choose from among the Democratic candidates when he voted at Edgemere Elementary School on Tuesday afternoon. He cast his county executive primary vote for County Councilwoman Vicki Almond, though it largely was a symbolic vote against Johnny Olszewski Jr.
McDonough has pledged to prevent any expansion of affordable housing, commonly known as Section 8, and he promises to go to court to challenge a legal settlement with the federal government that requires the county to help developers build more affordable housing. Olszewski, on the other hand, supports the housing agreement and would push for a law that would ban housing discrimination against tenants who pay their rent with government assistance. “I’m happy they’re having a primary to weed people out, whittle it down. It’s just a crowd of people and you can’t hear any one voice,” she said. 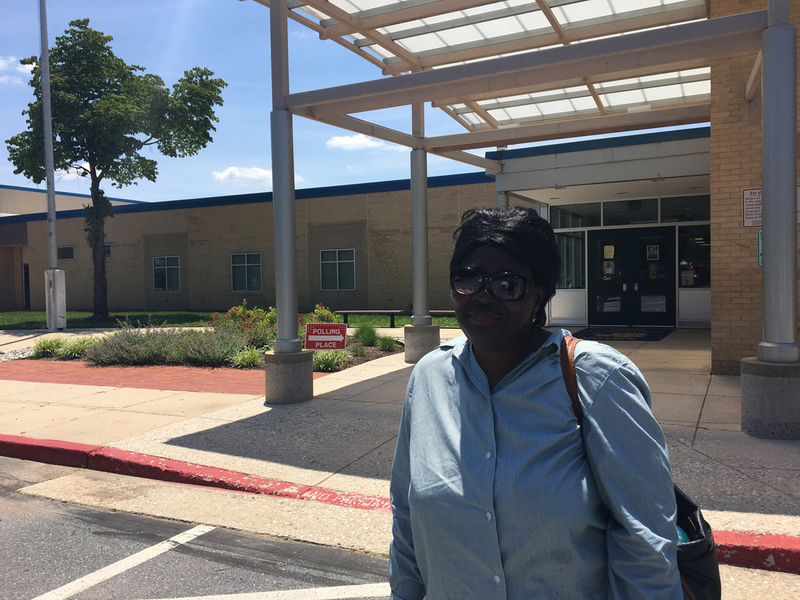 The Children’s Hospital employee said she voted for Rushern Baker for governor based on his record as Prince George’s County executive, and because she knew the most about him. She knew Ben Jealous’ connection to the NAACP, of which he previously served as president, but little else about him. Most of the other candidates she was completely unfamiliar with, she said. All the campaign literature in her mail had been too much to dig through. Once she sees who has won the Democratic primary for governor, she’ll do more homework on the candidate’s record, she said — because she’s not sure she’ll vote along party lines in the general election. While she has been turned off by partisan politics at the national level, she sees less of that in Maryland, she said. James Prettlow, 67, a maintenance mechanic, said he was energized by the Baltimore state's attorney race because he's tired of seeing convicted killers get out of prison. "We've got shooters right near here," the Democrat said at the Herring Run Branch Library in Orchard Ridge, where he lives. Prettlow said he voted for challenger Ivan Bates and hopes he will offer fewer plea deals. He said sentences now are too light and that prison is like "a revolving door." "I don't have much confidence in the current prosecutor," he said of incumbent Marilyn Mosby. Charging the six police officers involved in the death of Freddie Gray in 2015 "blew up in her face," Prettlow said. Prettlow said he didn't think much of the Democratic candidates for governor and pledged his support for Republican Gov. Larry Hogan in the general election. Janae Lampkin, 19, was voting for the first time. At Liberty Grace Church of God in West Baltimore, Janae Lampkin was excited to vote for the first time. “I was always told that it is good to vote,” said the 19-year-old who works for Amazon. “If you don’t vote, nothing will change. Lampkin was influenced by her mom to vote for Jim Shea in the Democratic race for governor because of his running mate, City Councilman Brandon Scott, who they say is active in the community. Lampkin's choice for Baltimore state’s attorney was Ivan Bates, who she thinks will bring down crime. Plus, she liked that he was out campaigning in the community. J.D. Merrill, a candidate for state delegate, was Lampkin's teacher in high school. She's voting for him over Jill Carter in that race. “I liked him as a teacher so I decided to vote for him,” she said. Muti Padmore, 48, recently moved but hadn't updated her license yet. 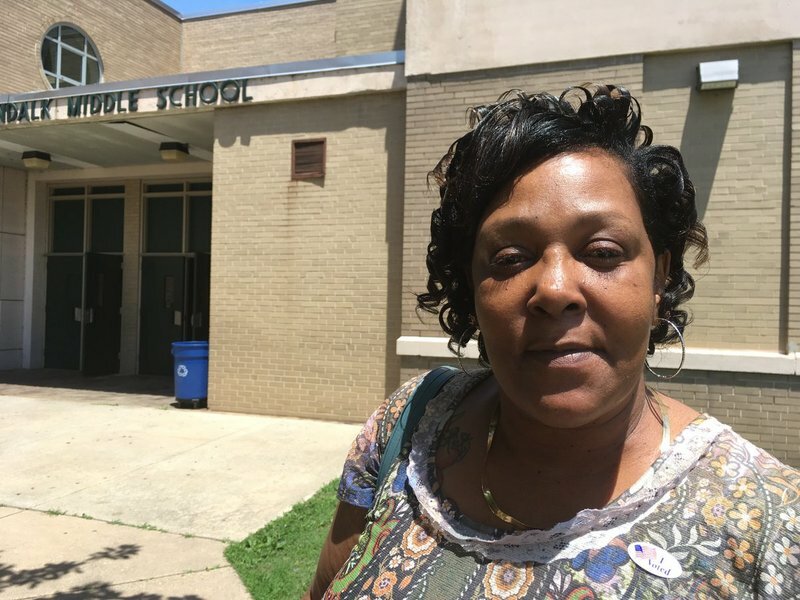 She came to Gaithersburg High School to vote, but was told she had to go to the elementary school down the road to vote or else fill out a provisional ballot. She said she was told if she chose the latter option, her votes wouldn't be counted right away, so she decided to drive to the correct polling place. The most important races for her were the national ones, because national politics have gotten so nasty and that's where the power rests, she said. She wanted to cast a vote for U.S. Sen. Ben Cardin. "It comes from the top down," she said. "The states can kick and scream all they want, but the real action happens in Washington." Padmore, a graphic designer and an immigrant from Liberia, said she was unsure of who she was going to vote for in the Democratic governor's race, but was considering Ben Jealous and Krish Vignarajah. She said with all the hostility in national politics, including around race and immigration, she liked that Vignarajah is "a woman and a person of color and with an immigrant background and a name not everyone can pronounce." Of course, she said there were other considerations, too, and she was undecided as she prepared to drive to her correct polling place. She does not like how incumbent Republican Gov. Larry Hogan has handled education funding, however, and wants him out, she said. "If it takes voting for a Democrat I am lukewarm about, so be it," she said. 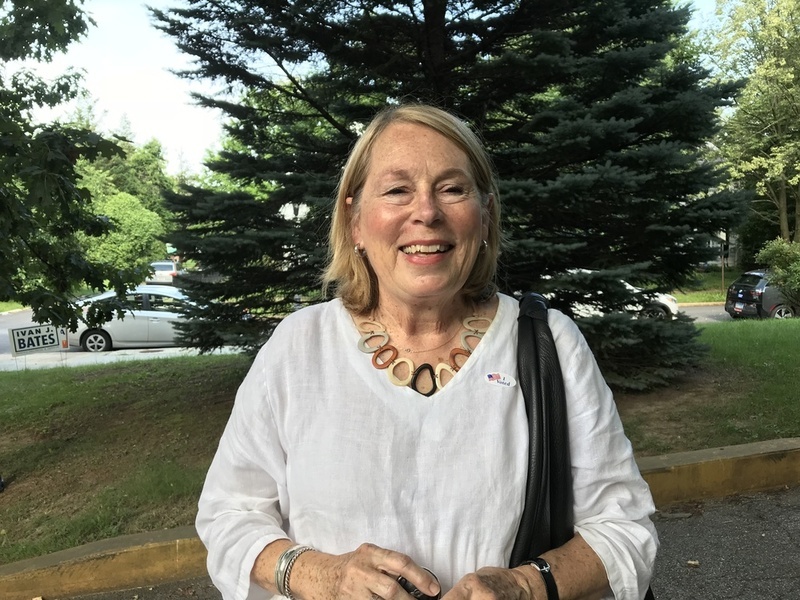 Jo Willman, 69, a Democrat who trained to be an election judge but ultimately decided against it, said she had heard about all the problems with voter registration, and expected long lines at Gaithersburg High School. "I was expecting there might be a backup," she said, because with provisional ballots, "one, people would be confused, and two, you have to spend more time proving your identity." But there were no crowds mid-afternoon, and no lines, she said. "It was like empty," she said. Willman voted for Jealous for governor, but isn't sure she'll vote for him in the general election. "Like several Democrats, I don't have any real problems with Hogan," she said. "He's proven himself to work on the issues and not the politics. He works across the aisle. If that's what we want people to do, who cares if it's a Democrat or a Republican?" She'll be studying the Democratic candidate's and Hogan's records more closely between now and the general election and watching for either to slip up, she said. Willman said she believes that with President Donald Trump and the leaders of his administration, there is "no concept that they are public servants." That shift has been regrettable at the national level, but it hasn't occurred in Maryland, which makes her more willing to consider voting across the aisle, she said. She said she hopes turnout for the primary is large, so that the party nominations represent the will of the people and not a tiny fraction of the electorate. Democrat Christa Burns voted for Rushern Baker, particularly because she respects his running mate, Elizabeth Embry. "I think she is committed to Baltimore and extremely conscientious," Burns said. The Presbyterian pastor also decided to support Marilyn Mosby, who she said had taken a courageous position in prosecuting the officers in the Freddie Gray case. The polling place at Charles and 39th streets in North Baltimore was busy all day. By 4 p.m., 548 people had voted; all but 28 were Democrats. Republican Nancy Van Meter, 62, wanted to come out to vote for Gov. Larry Hogan, even though he was uncontested in the primary. “I feel it’s my civic duty,” said Van Meter, a fine artist from Medfield. “I think he’s doing a great job." Van Meter and others ran into no trouble Tuesday afternoon at Medfield Heights Elementary School, where about 250 people had voted in the two precincts. Some voters were turned away earlier when one of the precincts opened late due to some trouble officials had setting up and an absent GOP judge. About 20 people had to vote using provisional ballots. Election judges reported no significant problems after the doors opened late. Among the problems facing voters at the polls today: A reported infestation of mice and fleas. 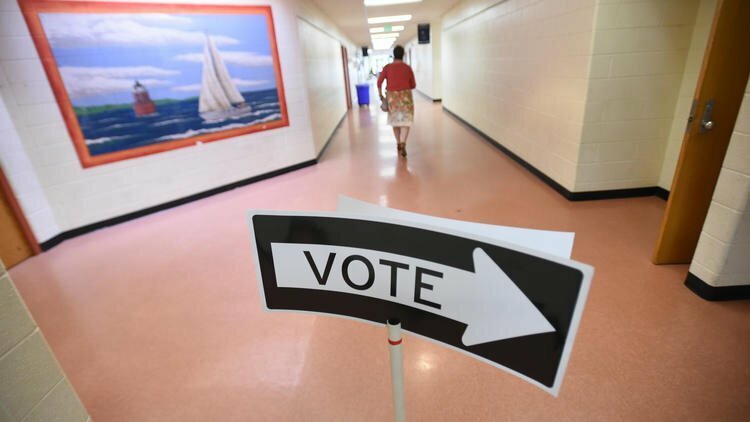 A mice and flea infestation at Patapsco Elementary/Middle School in Baltimore's Cherry Hill neighborhood prompted election officials to move the polling place to another location. At Eleanor Roosevelt High School in Greenbelt, Gladys Hampton was going with the familiar. 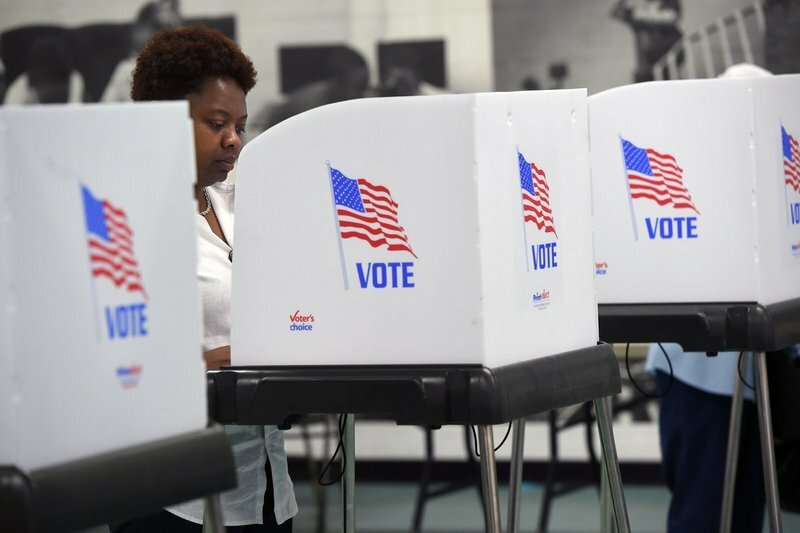 The 67-year-old homemaker cast her ballot for former Rep. Donna Edwards in the Democratic primary for Prince George’s County executive, and Prince George’s County Executive Rushern Baker in the Democratic primary for governor. She said there seemed to be fewer voters at the polls than in previous years. “It’s nice, because it’s not crowded,” she said. Greenbelt Mayor Emmett Jordan said voters appeared to be in good spirits. Jordan was at the polls to support a slate of legislative candidates. In the major races – for governor and county executive – he said the voters appeared already to have made up their minds. Applause erupted at Towson Presbyterian Church when election officials announced it was Mason I. Schwarz’s first time voting. Schwarz, a Towson resident, was among the Democrats casting votes at the church Tuesday. By 3 p.m., 396 voters — 112 Republicans and 284 Democrats — had turned out to the polling place. The votes at that time included five provisional ballots. Schwarz’s picks included Johnny Olszewski Jr. for Baltimore County executive and Ben Cardin for U.S. Senate. More than 13,600 voters had cast ballots in Harford County as of 4 p.m., with 58 of Harford’s 61 polling places reporting in, according to Stephanie Taylor, a project manager with the county Board of Elections. Taylor reported 7,838 Republican voters had cast ballots, compared with 5,795 Democrats. 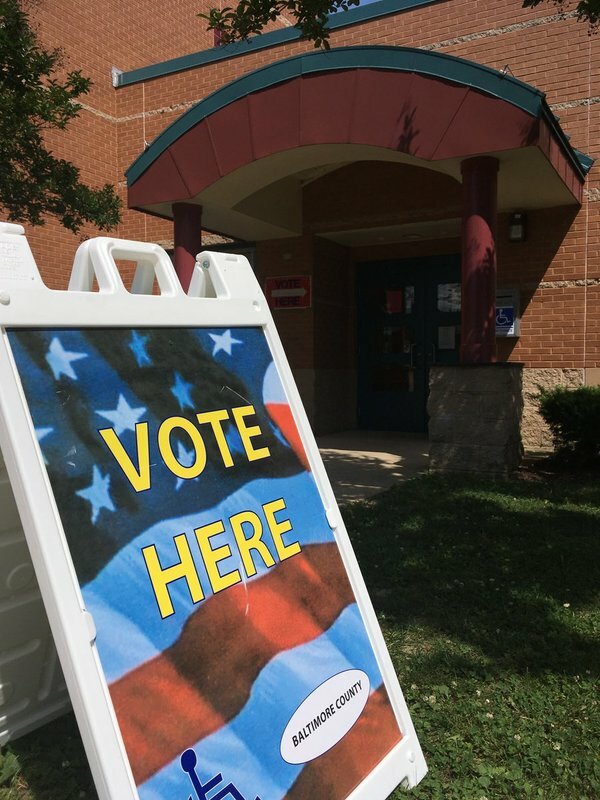 The polls will remain open through 8 p.m.
Election judges and campaign volunteers at polling places at Fallston Middle School, Fallston High School, Bel Air Elementary School and Meadowvale Elementary School reported slow but steady turnout in the morning and afternoon. That was the case countywide, according to Dale Livingston, deputy director of the county Board of Elections. She noted that turnout is typically lower in primary elections when there isn't a presidential race, plus the election is happening at a time of year when many people are on vacation. “It’s just a slow election,” Livingston said. Elections officials have not seen a large number provisional ballots cast, either, she said. “We’re not getting this big rush or deluge for provisional ballots,” Kevin Keene, the elections director, said. The number of provisional ballots distributed in Harford will not be known until later Tuesday night, according to Taylor. Harford County volunteer Sonja Karwacki sits in front of the polling place at Meadowvale Elementary School in Havre de Grace on Tuesday afternoon. 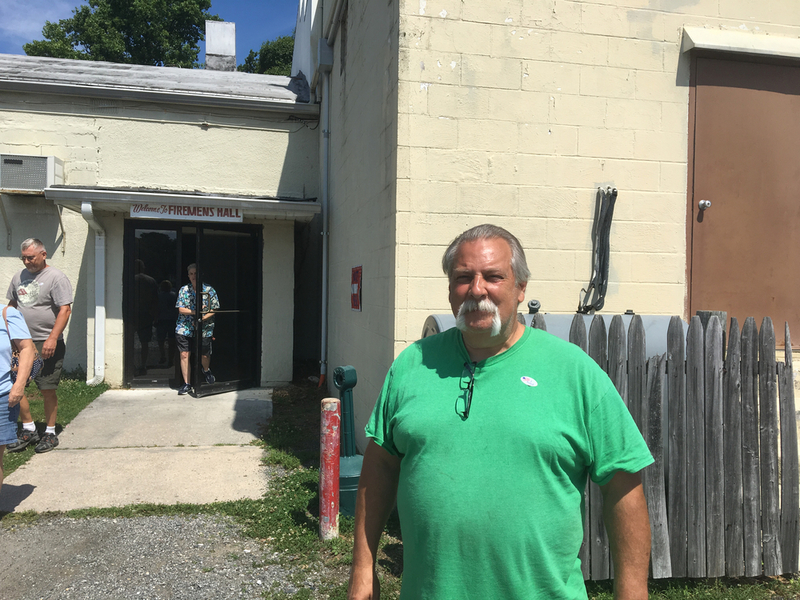 Campaign volunteer Sonja Karwacki said around 3 p.m. that voter turnout “has been slow, but it’s a steady stream of people” at the Meadowvale Elementary School polling place in Havre de Grace. Karwacki, an Abingdon resident, sat in a chair as she and other campaign supporters greeted voters as they entered and thanked them for voting as they left. Karwacki wore a shirt to support Harford County Councilman Curtis Beulah, a Republican who is battling two primary challengers – Amy Jahnigen and John Finlayson – as he seeks a second term as the District F representative. She also wore a sticker in support of Havre de Grace City Councilwoman Monica Worrell, one of four Republican candidates battling for two House of Delegates seats in their district. She is a candidate herself, running for the District F seat on the Harford County school board in the general election. She will face incumbent Thomas Fitzpatrick. At the city’s Public Safety Training Facility on Northern Parkway Tuesday afternoon, some voters were told by election officials they had the wrong location. Seeing Mosby, activist Duane “Shorty” Davis walked over. “When are you gonna drop charges against Keith Davis?” he asked, holding a smartphone to record the encounter. But Clark was unmoved. “I think that within different groups, men kind of step over women and don’t really give them the support, even when they are well qualified,” she said.